United to change the world through prayer and intercession. Answering the call to pray and intercede for the nations. If the ministry of Watchmen on the Wall Prayer Network has been a blessing to you and your family, would you please consider sowing into the ministry today. Your support will help us continue to serve the prayer needs of people around the globe. Thank you. Thank you for visiting our website. We are dedicated to praying for you and standing in the gap on your behalf as Watchmen on the Wall. We understand the importance of prayer and intercession. With these two spiritual keys, doors are unlocked for every area of your life as you seek God for His divine guidance. We are committed to helping the Body of Christ build a strong foundation in prayer and intercession. We're on a mission to raise up praying men and women, first in our communities, cities, state, nation, and world, to stand in the gap for those in need. We are called to take prayer into people's homes. Our assignment is to receive and intercede for the needs of individuals, families, co-workers, nation, and communities for the purpose of destroying strongholds, setting the captive free and bringing about deliverance. 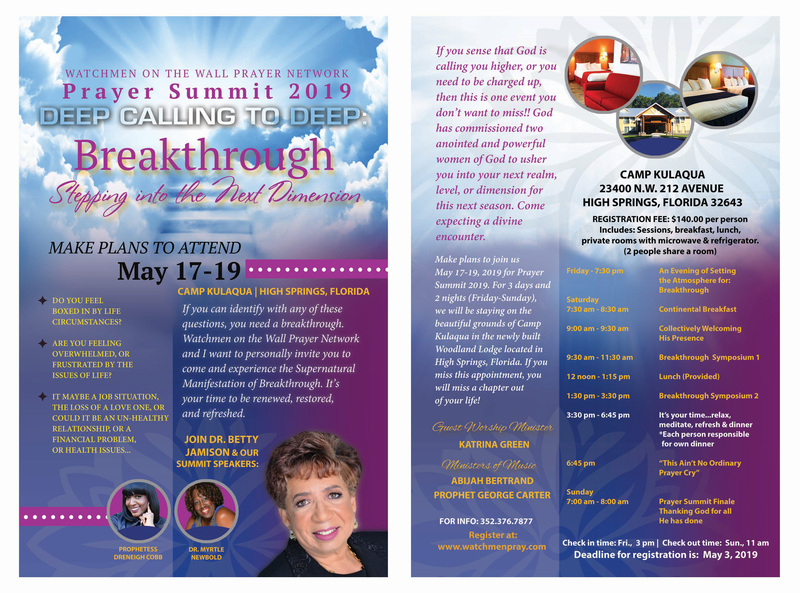 If you live in the Orlando area, don't miss these life-changing sessions. Mark your calendar to join us each month. Don't miss your power encounter, all right in the comfort of your own home or office via a tele-conference call. 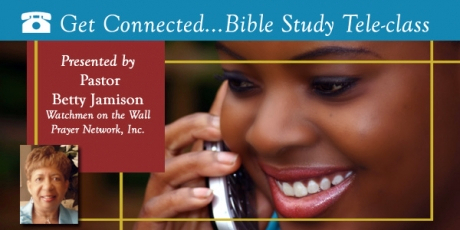 Make plans to join Pastor Jamison every other Wednesday for her bible-study tele-class. In each session she takes you deeper, as she under covers the treasures in God's word. Visit the Events calendar and make plans to join the next class.